You can control many key aspects of DataMigrator Server operations directly from the DMC. View and run flows by expanding the approot folder and its application directories. Create sample procedures and data. Set up log and statistics options. You can set up your DataMigrator Server to send an email message that notifies recipients of the successful completion or failure of every flow execution. In addition, from the DMC, you can enable the distribution of email messages at any point in a process flow. Note: You must be logged on as a Server Administrator with the appropriate privileges to make these configurations. In the DMC, expand the Workspace folder, followed by the Special Services and Listeners folder, as shown in the following image. Right-click SCHEDULER, and click Properties. The Scheduler Configuration window opens, as shown in the following image. Make your changes, and click Save and Restart Scheduler. For more information on the available options, see Scheduler Configuration Window. The DataMigrator Scheduler runs as a task under the iWay DataMigrator Server. The Scheduler must be running to submit flows and stored procedures, to execute scheduled data flows, and flows that run in parallel groups in a process flow. The following image shows the Scheduler Configuration window. Scans for flows to run under the ID listed. The Application Path specified in the user profile is utilized. Is how often, in seconds, you want the Scheduler to check for execution of flows. The default value is 60 seconds. yes automatically starts the Scheduler when the server starts. This is the default value. no does not start the Scheduler when the server starts. Note: The Scheduler must be running to execute not only scheduled data flows, but also restarted flows and flows run in parallel in a process flow. Determines the user ID that is associated with a scheduled flow when it is run. 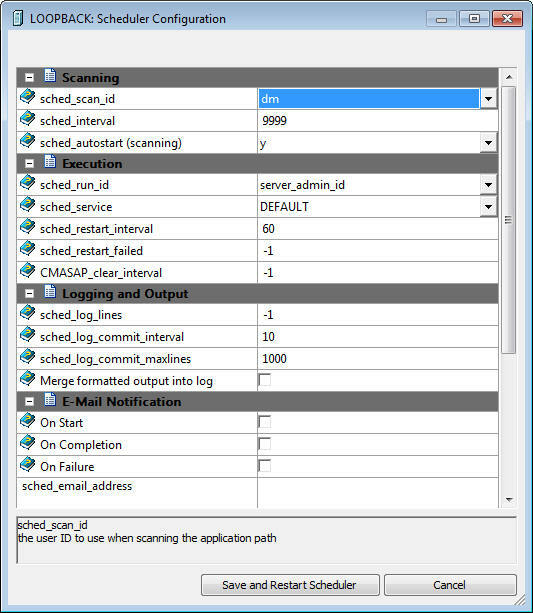 sched_run_id affects the application directories available to the flow, as well as access to relational data sources and source servers in the profile used by the administrator. Note: Flows submitted from the DMC, the Web Console, or CMRUN are run under the user ID that submitted the flow. 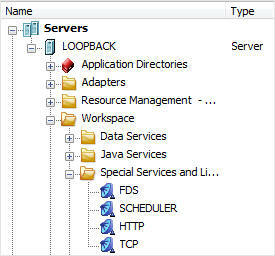 Runs flows under the first ID that appears in the list of server administrators displayed on the Access Control page. If the ID does not have a password specified, a profile for that user ID must be created. The default is server_admin_id. This setting enables access to all data sources and source servers in the path specified by that server administrator profile. Runs flows under the user ID that was used to save the flow. The Application Path specified in the users profile is utilized. The user ID must be a valid user on the system. The user ID must be set to an access level of either SERVER or APPLICATION from the Access Control page. The password for the user must be set. A SERVER-level administrator can set the password for a SERVER-level ID from the Access Control page when adding a user. A SERVER administrator must make them an APP administrator from the Access Control page. The user must set their password on the User Information page. This is the agent service that the DataMigrator Scheduler will use when running DM flows. If this is not set, the DEFAULT service will be used. Specifies the time interval between restart attempts for all restartable flows. The default value is 60. Note: This value cannot be less than 0. Specifies the number of times that failed agents will be restarted. If the value is 0, they will not be restarted. If it is -1, they will be restarted indefinitely. The default value is -1. Specifies how often CMASAP agents are removed from the agents list, in seconds. When set to -1, this is never. The default value is -1. Maximum number of lines that the DataMigrator Scheduler is to write to the log for each flow. When the maximum number of lines is reached, logging stops. When set to -1, the number of lines is unlimited. When set to 0, there is no logging. The default value is set to -1. Note: Some essential lines will still be imposed into the ETL LOG, even when the number of lines (sched_log_lines) is limited to a positive integer. For more information, see List of Essential ETL LOG Message Codes. Specifies the maximum time interval in seconds that can elapse before log data is committed to the DataMigrator log. The default value is 10. Specifies the maximum number of log lines to collect before committing them to the DataMigrator log. The default value is 1000. Select this option to set the output from a report to go to the log. Only text output is displayed to a maximum width of 80 characters. This is the prior behavior. Note: To view report output, in the browser right-click on the flow name and click Logs. Then, click Last Output to view the output from the last run, or select Log and Statistics. For Report Range select All, and then right-click the job id in the report and click Show Output. On Start sends an email when the scheduler starts. On Completion sends an email when the schedule completes. On Failure sends an email if the schedule fails. off does not send email for every flow, however, you can send email per flow from the DMC. This value is the default. Tip: If you wish to send email notification on a per-flow basis, select the Notify check box in the Properties panel of your DMC. completion sends email when every flow has been completed. failure sends email when every flow fails. Note: Before you can use email notification, you must configure an email server. For more information, see How to Configure the Server for Email Notification. 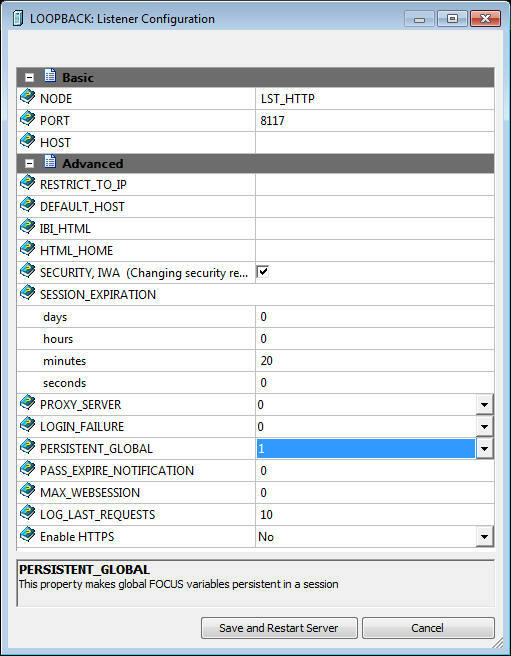 From the DMC, connect to the server with an administrator user ID. Expand the Workspace folder, and then the Special Services and Listeners folder. If the scheduler is running, select Stop Scanning. If the scheduler is not running, select Start Scanning. APPLICATION-level administrators can change their configured passwords from the DMC. In the DMC, right-click the server name and select My Console, then Change Password. The User Information dialog box opens, as shown in the following image. Enter your current operating system password in the Current Password field. Enter the password in the New Password and Confirm Password fields. 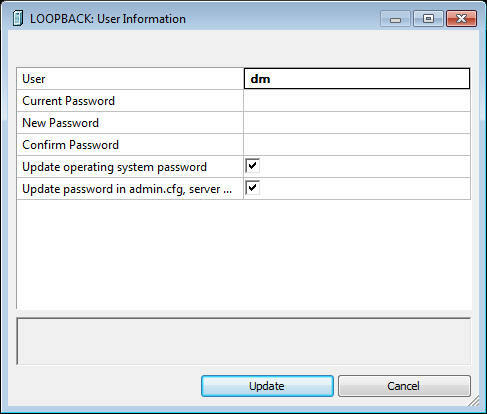 Select the Update operating system password or Update password in admin.cfg, server will be restarted check box. Note: Changes to the password will take effect the next time the server or scheduler is restarted. In the DMC, right-click the Workspace folder and select E-mail SMTP Server. 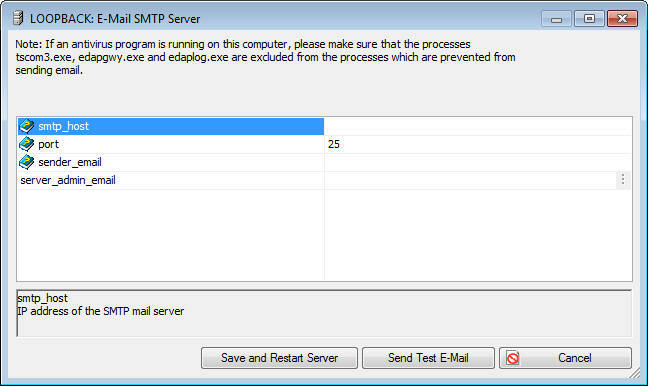 The E-mail SMTP Server dialog box opens, as shown in the following image. smtp_host defines the IPv4 address of the SMTP email server. The address can be in standard dot notation (for example, smtpmail.yourcompany.com). Port specifies that the mail server is bound to the TCP port that is shown. sender_email defines the email address of the sender, which appears in the 'From' field in emails (for example, yourname@yourcompany.com). server_admin_email defines the email address of the receiver (for example, yourname@yourcompany.com). Send email when a flow finishes. Send email when a flow fails. Note: This setting applies to every flow. 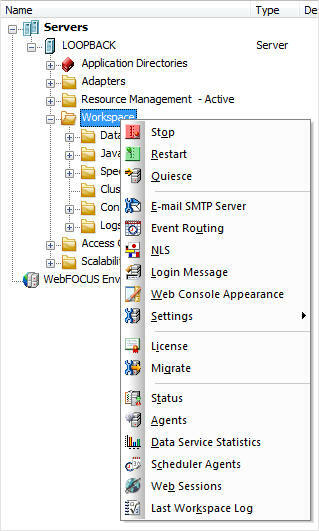 In the navigation pane of the DMC, expand the server and then right-click the Workspace folder, as shown in the following image. Select Settings and click Miscellaneous Settings. The Miscellaneous Settings dialog box opens, as shown in the following image. For details on the server configuration, see the Server Administration manual. In the navigation pane of the DMC, expand the server and then right-click the Workspace folder. Select Settings and click Core Engine Global Variables. The Core Engine Global Variables dialog box opens. The Core Engine Global Variables dialog box opens, as shown in the following image. From the Command drop-down menu, select DEFAULT or SET. In the Name box, enter the name for the global variable. Do not use ampersands. In the Expression box, enter the value of the variable, enclosed in single quotes for character values. In the navigation pane of the DMC, expand the server and then expand the Workspace folder. Right-click the Configuration Files folder and click New Backup. Click OK to confirm the backup. 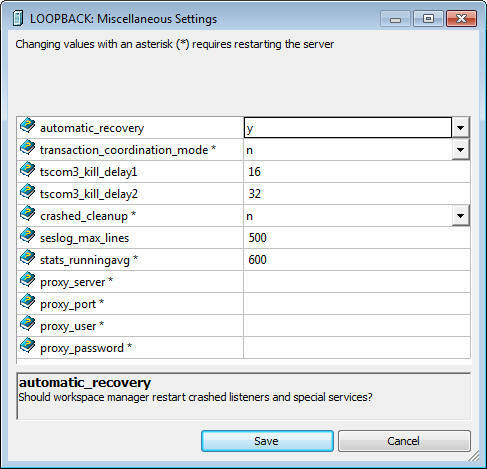 Right-click the Configuration Files folder and click Manage Backups. The Configuration Files Backup dialog box opens. Right-click the file you want to restore, or expand it and right-click on a specific file. Click Restore. Application settings control some aspects of use of application directories. You must be a server administrator to change any of these settings, and they require a restart of the server to take effect. From the DMC, log on with a server administrator user ID. Expand the Workspace folder, select Settings and click Application Settings. The Applications Settings dialog box opens. Make any necessary changes and click Save and Restart Server. When you connect to the server a temporary directory called foccache is added as the first directory in the search path. When you want to be able to reuse data within the same session, you can store the data in the form of a HOLD, SAVE, or SAVEB file in the foccache directory. As long as the session remains active, the files stored in the foccache directory can be referenced in requests. 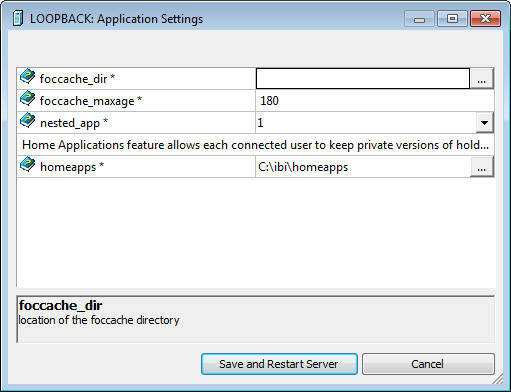 Foccache is also used to store some system created temporary files. Defines the maximum number of minutes that a foccache directory will last. When the maximum foccache retention time is reached, the foccache directory is removed by the server and can no longer be referenced. The default is 180 minutes. When set to y, nested applications are enabled. This is the default value. To disable, set to n.
A home application directory provides each user with a private application directory with full access privileges to store private focexecs and data for the test runs and ad hoc reports. The operating system specific pathname. Defines the location of home application root directory. If defined, each connected user will see the My Home applications folder on the Application tree. User can create new applications (home applications) in this folder. These applications will be visible and available only to the connected user and the server administrators. The user will have full access to their home applications. For this setting to work nested_app should be set to y. Global variables can be used by various users, regardless of the fact that each user has their own profile, by changing a listener configuration property. Note: This is available for HTTP Listener only. In the DMC, expand the Workspace folder. Expand the Special Services and Listeners folder and right-click HTTP. The Listener Configuration window opens. Select 1 in the PERSISTENT_GLOBAL drop-down menu, as shown in the following image. The values of any global variables will now be kept active as long as you stay connected to the server.